Excellence in valuation service delivery is paramount in creating a seamless customer experience that leads to a quick mortgage offer and a speedy trouble free completion. Getting this right helps many other areas. Intelligently mapped lender guidance notes help the valuer make better decisions when carrying out surveys and reduces the number of failed completions as unacceptable properties are flagged earlier. Errors and omissions managed in this way reduce post valuation queries by a third delivering more certainty in the mortgage approval process. Giving surveyors access to better data to make better comparable analysis on the same day or even during the valuation itself ensures a consistent, quality and timely comparable analysis and a speedier returned valuation. Surveying businesses looking to provide additional services to their lender clients want to assess each instruction and make insightful data led decisions about what type of property assessment is required. eTech’s Survey Hub provides this for thousands of transactions every day deploying resources more economically. Within our SMART Survey iPad tool surveyors can now access multiple data sources to inform their decision-making whilst on site or on the road. Whether the surveyor is assessing a new build property, carrying out a buy-to-let valuation, inspecting a property of non-standard construction or a modern method of construction, more decisions can now be made more quickly with the combination of surveyor, technology and data. Furthermore, firms also want to make rapid decisions based on configurable rules as to who should carry out the valuation based on capacity, experience, location, PI and many other factors. These detailed rules are critical to businesses and can be changed in real time as business needs change. 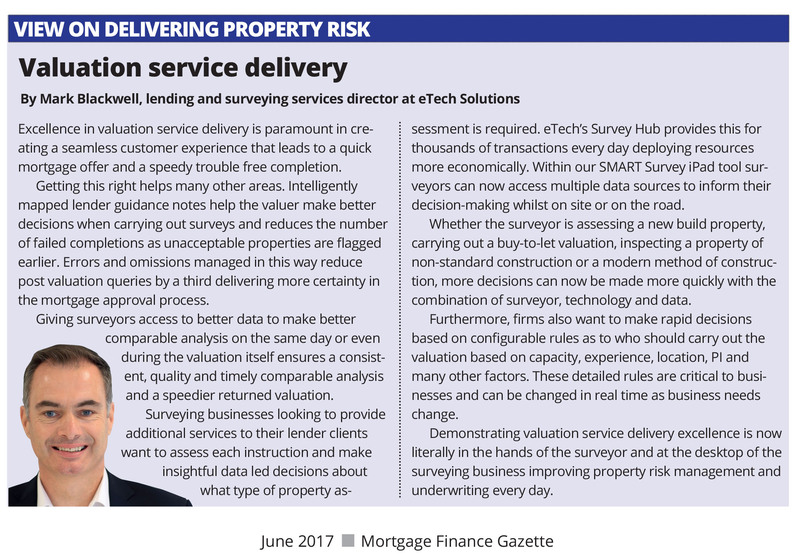 Demonstrating valuation service delivery excellence is now literally in the hands of the surveyor and at the desktop of the surveying business improving property risk management and underwriting every day.